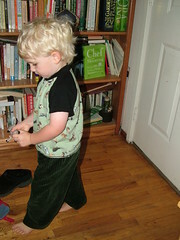 I made this outfit back in March for Andrew's 3rd birthday, he didn't really want to model for me though. Raglan from KSFT with cute dog fabric I think I also got at sewzannes.com, pants are a wide leg pajama pattern, McCalls 4242, which I love and use all the time for easy peasy pants. The gorgeous wide wale corduroy came from the remnant table at Beverlys. Kaia wanted new PJs for pajama day at school. I hadn't sewn in almost 2 months, these took me a couple of hours and I'm pretty happy with them. 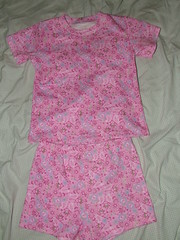 Pattern is from the Kwik Sew for Toddlers book, t-shirt and knit shorts patterns, size 4t. Fabric is from www.sewzannes.com. Model is currently asleep.